As much as we’d like to think stone is forever and our patio that we installed last year is one and done, in reality we still need to take a few steps to ensure the natural beauty will shine through for years to come. Sure, it sounds simple, but taking the time to remove everything on your patio annually for a visual inspection is actually an important first step. A visual inspection allows you to nip any problems in the bud and address issues immediately. Or stacked. Or set in an underlayment. If you have a vintage patio, you might have flagstones held in place by a concrete-like mortar. Over time, this can begin to crumble and the stones themselves may sink. Check for puddles after a rainstorm and see if you have areas where the water collects. Brickwork can sometimes shift, resulting in portions that heave or sink, creating an uneven surface, and stacked borders can shift if the support is disturbed. If you run across any of these issues, it’s a good idea to bring in a contractor to get to the root of the problem. Sometimes these problems are caused by improper water drainage and/or settling. Rather than addressing the symptom, find a professional who can identify the cause. Like everything else in life, patios and stonework tend to last longer is they are kept clean and well-maintained. While a do-it-yourself power washing can be tempting, keep in mind the force behind the water can end up doing more harm than good in inexperienced hands. Regular brushing off of surfaces can help to keep your patio looking good. Pull weeds early when they appear; try not to give them time and room to get established and cause lasting damage. A gentle cleaning with household dish soap and a brush is usually enough to refresh and clean, followed by a good rinsing with the garden hose. Stubborn stains may require a mixture of bleach and water, but apply sparingly to avoid damaging any surrounding plantings. 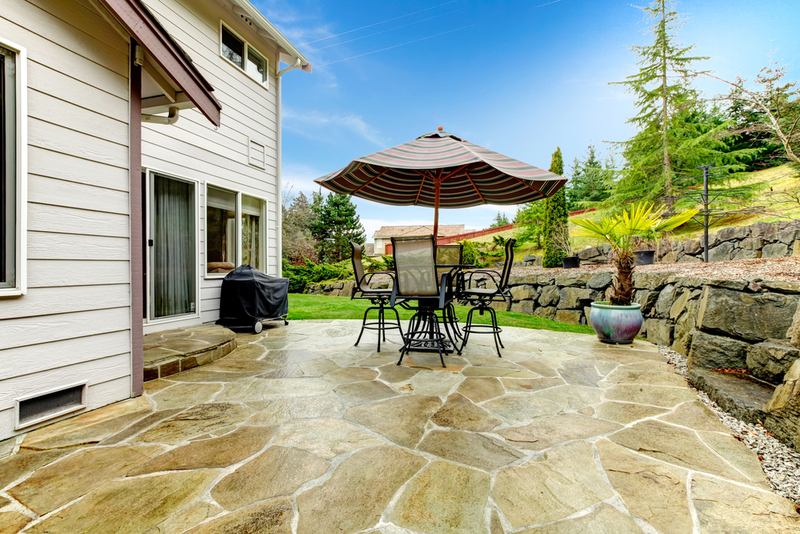 If you’ve inherited a patio that didn’t see much maintenance, it may be time for a do-over. Crumbling mortar and broken pavers and flagstones will reach a point when a better, and safer, choice is to remove the old patio and install a new patio or deck in its place.